The discovery of the extragalactic signal is among the first, eagerly awaited results from the Canadian Hydrogen Intensity Mapping Experiment (CHIME), a revolutionary radio telescope inaugurated in late 2017 by a collaboration of scientists from the University of British Columbia, McGill University, University of Toronto, Perimeter Institute for Theoretical Physics, and the National Research Council of Canada. In a resounding endorsement of the novel telescope's capabilities, the repeating FRB was one of a total of 13 bursts detected over a period of just three weeks during the summer of 2018, while CHIME was in its pre-commissioning phase and running at only a fraction of its full capacity. 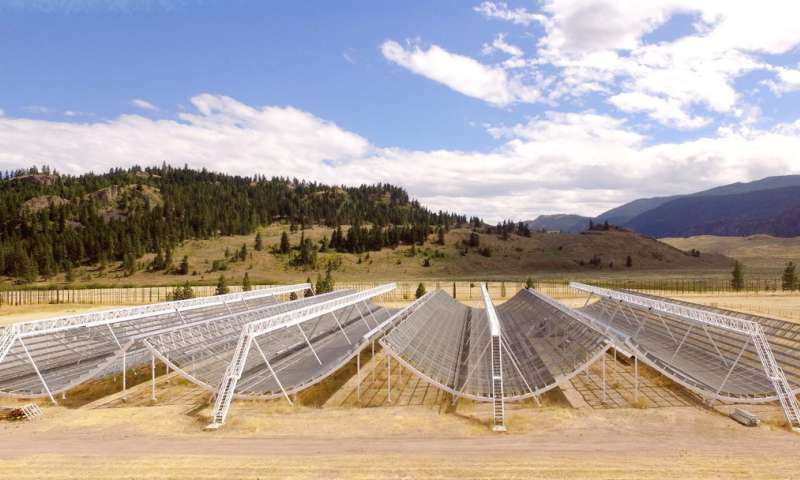 Additional bursts from the repeating FRB were detected in following weeks by the telescope, which is located in British Columbia's Okanagan Valley. Of the more than 60 FRBs observed to date, repeating bursts from a single source had been found only once before—a discovery made by the Arecibo radio telescope in Puerto Rico in 2015. "Until now, there was only one known repeating FRB. Knowing that there is another suggests that there could be more out there. And with more repeaters and more sources available for study, we may be able to understand these cosmic puzzles—where they're from and what causes them," said Ingrid Stairs, a member of the CHIME team and an astrophysicist at UBC. Before CHIME began to gather data, some scientists wondered if the range of radio frequencies the telescope had been designed to detect would be too low to pick up fast radio bursts. Most of the FRBs previously detected had been found at frequencies near 1400 MHz, well above the Canadian telescope's range of 400 MHz to 800 MHz. The CHIME team's results—published January 9 in two papers in Nature and presented the same day at the American Astronomical Society meeting in Seattle—settled these doubts, with the majority of the 13 bursts being recorded well down to the lowest frequencies in CHIME's range. In some of the 13 cases, the signal at the lower end of the band was so bright that it seems likely other FRBs will be detected at frequencies even lower than CHIME's minimum of 400 MHz. The majority of the 13 FRBs detected showed signs of "scattering," a phenomenon that reveals information about the environment surrounding a source of radio waves. The amount of scattering observed by the CHIME team led them to conclude that the sources of FRBs are powerful astrophysical objects more likely to be in locations with special characteristics. "That could mean in some sort of dense clump like a supernova remnant," says team member Cherry Ng, an astronomer at the University of Toronto. "Or near the central black hole in a galaxy. But it has to be in some special place to give us all the scattering that we see." Ever since FRBs were first detected, scientists have been piecing together the signals' observed characteristics to come up with models that might explain the sources of the mysterious bursts and provide some idea of the environments in which they occur. The detection by CHIME of FRBs at lower frequencies means some of these theories will need to be reconsidered. "Whatever the source of these radio waves is, it's interesting to see how wide a range of frequencies it can produce. There are some models where intrinsically the source can't produce anything below a certain frequency," says team member Arun Naidu of McGill University. "[We now know] the sources can produce low-frequency radio waves and those low-frequency waves can escape their environment, and are not too scattered to be detected by the time they reach the Earth. That tells us something about the environments and the sources. We haven't solved the problem, but it's several more pieces in the puzzle," says Tom Landecker, a CHIME team member from the National Research Council of Canada. And some background on radio astronomy. People are used to seeing giant parabolic antennae or reading about satellites. This is good for concentrating on a source, but it's not so good for finding sources. A wide field telescope like this one can scan a significant fraction of the sky, and if we had just a few more we'd be able to see the radio sky everywhere all the time. Not only congratulations for this discovery, but for inventing a new tool for radio astronomy, to this Canadian team. Hopefully the next one will be in Australia, and ones after that in Europe and South America and the Indian Ocean and Africa. That should give full coverage which is important for these transient events, and confirmation from multiple sources which is important for science. Yes, kudos to the Canadians for designing and implementing CHIME. I can remember the bewilderment of many people when they learned of the wood-and-wire antenna array . . .